When most people think about shopping in Mexico, they probably think about buying souvenirs while on vacation. The souvenirs might include silver or other typical textiles. 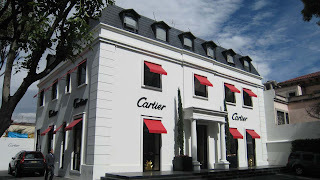 But Mexico offers some of the most exclusive shopping experiences in the world. Avenida Presidente Masaryk (Maz-ah-REEK) is the place to see and be seen in Mexico City. Located in the residential Polanco neighborhood, Masaryk is a street completely lined with boutiques, restaurants, and night clubs. Although you can explore Masaryk by foot, all of the boutiques offer valet parking and it is probably most convenient to go from store to store by car. Most of the boutiques are free-standing structures or are grouped in groups of 4 or 5 stores. There are two small boutique “malls” located on Masaryk. 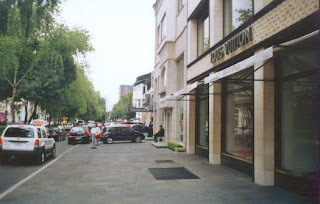 Some of the stores you can find on Masaryk include: Gucci, Hermes, Burberry, MaxMara, Cartier, Frette, Louis Vuitton, and Salvatore Ferragamo to name a few. Here’s a tip ~ the Hermes store in Mexico City is known for having bags that are sold out or unavailable in other parts of the world! Believe it or not, you can also shop at American Apparel and Lacoste on Masaryk. There’s something for everyone. Another gem is Zara, a Spanish chain, known for fashion-forward, budget friendly style. I especially love their children’s clothing because it is so styled, and not baby-ish at all. 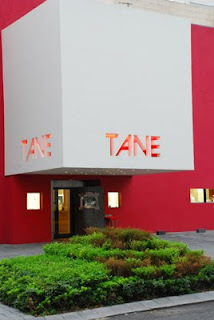 You might not have heard of Tane, but this boutique offers some of the most exquisite silver design I have ever seen. Their household items are divine. 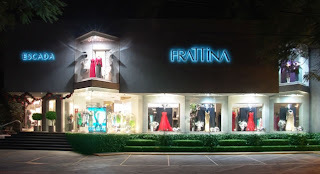 Frattina is THE PLACE to go for gowns for weddings (unless you’re the bride, then go to Pronovias) and other social occasions. Frattina offers a variety of designers including Escada, La Perla, and Carolina Herrera. After you’re finished with your shopping, you can enjoy a delicious meal at any one of the numerous restaurants located in Polanco. Most of the restaurants located on Masaryk have al fresco seating. You can enjoy a leisurely lunch with friends and the wait staff will not hurry you to leave at all. My favorite casual restaurant is Garabatos. The menu is simple, light fare including salads, sandwiches, and other specialties. The real treat is the dessert menu! 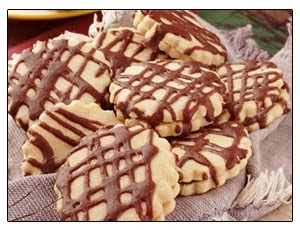 A “garabato” is a shortbread cookie drizzled in chocolate. I always order the Garabatos sundae for dessert when I go there! You can also buy the pastries and cookies to go. A plate of cookies and other treats from Garabatos always made a great gift when I went “visiting” friends who had just had a baby or were at home sick. You’ll have to leave Masaryk, but only by a few blocks, to go to one of my other favorite Polanco restaurants. Fisher's has some of the best seafood and a fantastic atmosphere in the afternoons, especially on a Friday or Saturday. If you're ever in Mexico City, this restaurant should be on your list. Besides the most delicious seafood you'll ever try, your drinks are prepared in front of you and you tell the server how stiff you'd like your drink. Be sure to try the shrimp tacos! Remember the wonderful shopping in Mexico City and save some space in your suitcase for some of these elegant treasures on your next trip. Great post! I never would have known that such shopping was available in Mexico City! Wow! We didn't have that kind of shopping in Leon! I really missed out! I left something for you on my blog! Hope you are still enjoying the snow?!?! Mexico! What a lovely way to leave all the snow worries behind! So nice to know that there is another side of Mexico... I just didn't know!